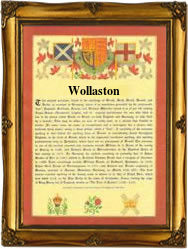 This picturesque surname recorded in the spelling of Wollaston, Wollerston, Woolaston, Woollaston, and other spellings, is of early medieval English origin. It is a locational surname, either from the village of Woolstone in Gloucestershire, or from Woolverstone in Suffolk, or possibly from another now "lost" medieval hamlet in Lincolnshire. The derivation of the former place, is from an Old English pre 7th Century personal name, "Wulfsige", with "tun", meaning an enclosure or settlement, and of the latter place, Woolverstone, from a different personal name "Wulfhere", with the second element "tun" as before. Both places are recorded in the Domesday Book of 1086, respectively, as "Olsendone", and "Ulverestuna" or "Hulferestuna". Among the early recordings taken from authentic church recordings of the period are those of Fulke Woollaston, who married Susana Townsend on October 11th 1669 at Blockley, Gloucestershire, and in Suffolk, the christening of Mary Woollaston on May 12th 1660, at All Saints, Sudbury. The first recorded spelling of the family name is shown to be that of Gilbert Wolstan, which was dated 1199, in the charters known as "The Pipe Rolls" for the county of Lincolnshire. This was during the reign of King John of England, known as "Lackland", 1199 - 1216. Throughout the centuries, surnames in every country have continued to "develop" often leading to astonishing variants of the original spelling.